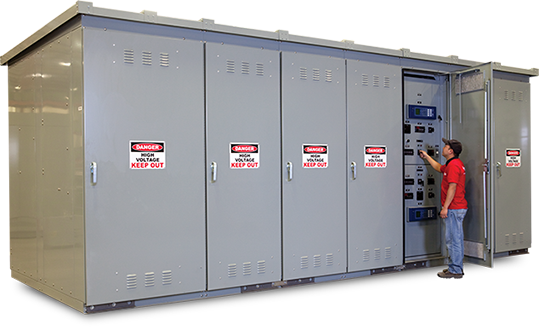 IEM’s vacuum circuit breaker product line is available in the 5kV, 15kV, 27kV, and 38kV classes in outdoor non-walk-in, outdoor walk-in and indoor enclosures. Selection of specific protective relays, metering devices and circuit breakers for specific applications is optional. This customizable feature makes IEM an ideal choice for unique projects and for matching or upgrading existing installations. Fully rated bus is based on density ratings, not UL heat rise tests, resulting in more bus and lower operating temperatures.All enclosures are finished using a state-of-the-art powder coating system providing an indoor finish that exceeds the 1500 hour salt spray testing requirement for outdoor equipment to 3000 hours.Component and metering selections are based on value engineering for the application and optimized to meet specifications. IEM Switchgear meets or exceeds all ANSI, IEEE, and NEMA standards applicable to metal clad switchgear including C37.20, C37.20.2, C37.20.3, C37.55, C37.57, and NEMA SG-4.